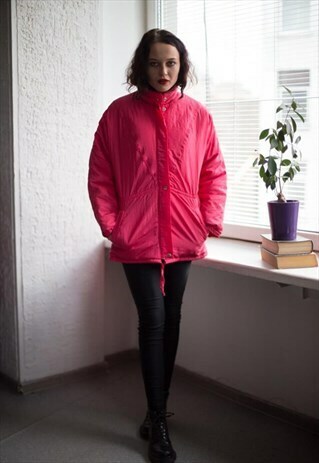 Vintage 80's hot pink zip up jacket with double fastening, high collar, side pockets and elasticated waist and cuffs. UK size not written but looks like 10-12. Model size in the photo - 8. Measurements: length 29 inches, sleeves 24 inches, chest 48 inche, waist 38 inches.